Mahugnon is a specialist in international environmental negotiations and sustainable development. 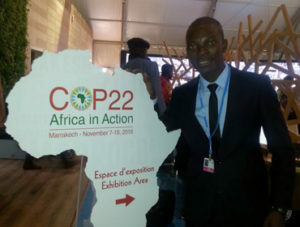 He participated as a youth delegate from Benin in the climate negotiations at COP22 in Marrakesh in November 2016. Here he offers his reflections on the outcomes of the COP22, and the challenges of youth participation in this process. The COP22 (called the ‘COP of action’) did not live up to the climatic emergency of the current moment, given its mixed results, and also missed the opportunity to make African youth a catalytic agent of climate action. Nearly absent from the plenary sessions of theSubsidiary Body on Implementation, Subsidiary Body for Scientific and Technological Advice (SBSTA), and the Meeting of the Parties to the Paris Agreement (CMA), numerous youth actions in the Blue Zone (main conference area) and the Green Zone (space for civil society) did not prevent negotiators from delaying the most important decisions to be made in Marrakesh and putting them on the agenda of Bonn (COP23) or even Warsaw (COP24). After the historic Paris Agreement that was adopted at COP21, COP22 began on November 4, 2016 as the ideal framework for creating the conditions to effectively implement the important advances made in Paris in 2015. These advances had come after 20 years of international negotiations on climate change under the United Nations Framework Convention on Climate Change (UNFCCC). Marrakesh was thus poised to take action to concretize the different axes selected in the Paris Accord, in particular those relating to adaptation, transparency, technology transfer, mitigation, capacity building and loss and damage. COP22 was therefore named ‘the COP of action’. But from Paris to Marrakesh, the world’s leaders have remained deaf, dumb and blind with regard to the danger of climate change. One thing is clear- in the face of the increasing climate dangers, we are still left waiting for actions that match the severity of the risks. Indeed, if Marrakech is pleased to have served as a platform for the launch of the Marrakech Partnership for Global Climate Action, the Marrakech Proclamation for Climate Action and Sustainable Development only reaffirms the commitments already made in Paris. One has the impression that nothing moves, because if we are not moving forward, it is because we are moving back. Marrakesh was unable to agree on a concrete roadmap to mobilize $100 billion dollars beginning in 2020 as funding for projects, giving priority to adaptation projects. The promise of $100 billion dollars every year from 2020 is there in the Marrakesh proclamation, but where will it come from? How exactly will it be used? These are some of many questions that the COP22 was unable to resolve. While adaptation projects should become a priority as countries of the Global South have demanded, these projects will not receive more than a quarter of the $100 billion. Negotiators turned a deaf ear to the relative lack of funding for adaptation and preferred to turn a blind eye to the Agreement’s inability to truly protect the people most affected by climate change. African youth was at the same time present and absent in the Marrakesh process. At the 1st session of the Conference of the Parties serving as the Meeting of the Parties to the Paris Agreement, only a dozen countries came to Marrakesh with youth delegates. However even the youth delegates that were there were not in any way associated with the open discussion on the operationalization of the Paris Agreement, apart from the 3-minute speeches that youth delegates were allowed at the closing session. It is clear that there is a great gap between the discourse of our leaders and the reality, when in their discourse all leaders want to make young people real actors in the sustainable development of their societies. Although Africa has benefited from the COP22 to launch the African Renewable Energy Initiative and the African Adaptation Initiative, African youth were not meaningfully associated with these processes. However, with their small voice, African youth hope to take up the challenge driving a new dynamism to maintain the mobilization initiated at the COP21. In particular, African youth hope to encourage an upward reassessment of the ambitions of countries indicated by their Intended Nationally Determined Contributions (INDCs) in order to reduce carbon emissions gaps by 2020. Here it is important to note the important initiative of the OIF (International Organization of La Francophonie) in Marrakesh that mobilized strategic partners around the question of youth and funding for sustainable development actions, as well as the Swiss government who created a youth space in the Green Zone which served as a platform to promote youth-led innovations during the COP22. This space was the centre of gravity for many youth organisations and associated actors, and allowed youth to reflect, discuss and debate with other actors on the climatic future of our planet. We need to seriously rethink climate negotiations and allow youth to be the agents of paradigm change by engaging them in global climate action. Youth have the capacity to push static boundaries and have demonstrated it many times. As well, youth are currently innovating and bringing change everywhere throughout Africa, and they need support. It is imperative to financially support the innovative actions of young people. Climate finance, therefore, will have to be made accessible to young people who are developing technologies which are transforming their communities. These technologies are needed in local, regional and global mobilization and communication for the construction of a more resilient, inclusive and sustainable world. Given the cost of inaction at COP22, which has already cost us more than climate action would, youth clearly deplored the inaction of our leaders at the closing session of the CMA. 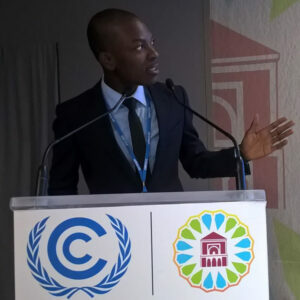 In his final speech on behalf of UNFCCC Youth Constituency (YOUNGO), Edwin Muhumuza (Uganda) reminded negotiators that climate change is a reality, and criticized their passivity and decision to wait for future negotiations to make decisions that will allow us to move forward. Thus, the results of Marrakesh is do not measure up to the urgency of climate change. The focus has therefore turned to Bonn, which will host COP 23 under the organization of Fiji, and COP24 in Warsaw, to adopt the roadmap for the operationalization of the Paris Agreement.